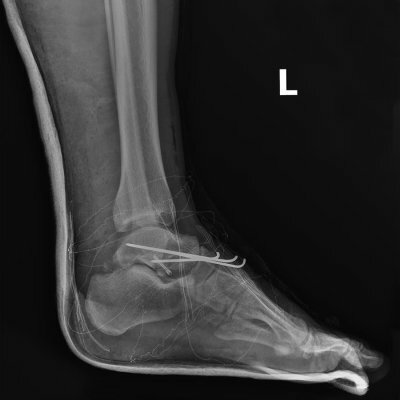 Surgical hardware is often a part of foot surgery. There are a few different types of hardware that your foot surgeon in Sugar Land may use, depending on the nature of the problem you’re experiencing. In many cases, the hardware works flawlessly to help patients get over their foot pain and regain their mobility, but in some cases, hardware has to be removed during revision surgery. Here are the facts you need to know about surgical hardware and how it is used during foot surgery. Surgical hardware consists of implants your surgeon uses during a procedure. The implants can be made of metals, plastics, and composite materials. In foot surgery, the most common types of hardware used are screws, rods, and plates. Your doctor will help you decide which implant material is right for you. Metal implants are visible on imaging tests, so it is easy to see if they could be causing a problem if you experience pain in the future. The downside is that they cover up the bone underneath. Plastic and composite materials are difficult to see on imaging tests, so it’s harder to diagnose a problem with them, but because they don’t cover the bone, it’s easier to see if damage to a bone is causing an issue. Hardware can be used in many different ways in foot surgery, depending on your needs. Screws may be used to hold bones together after they have been broken. Plates and rods can be used for treating fractures. In some cases, hardware is used to strengthen tendons and ligaments or to replace bone that has been lost or is deformed. When does hardware need to be removed? Most patients will never need to have their hardware removed. However, if pain persists after surgery or incomplete healing has occurred, your foot surgeon may remove the hardware during revision surgery. Occasionally, scarring after surgery can cause nerve damage. If this happens, your surgeon may opt to remove the hardware.